In my previous post titled Writing a Technical Book, I discussed phases of the process of writing a technical book. In this post I share details of my approach to writing a technical book. First, a disclaimer. I want to be very clear: This is but one way to write a technical book. This is not the only way and there are likely better ways to write a technical book. This works for me; your mileage may vary. I choose to list the problems I am trying to solve and my responses. Publishing is a business. Books are commodities in the publishing world. Like every other commodity on the planet, books are treated as goods to be sold, deliverables to be delivered. While the publisher desires a well-written book, they want a book above all else. The process of writing a technical book is fraught with impedance mismatches – the misalignment of the goals between the author and publisher. One example: the author may see the book as their magnum opus. The publisher desires a good book, well-written. But most of all, the publisher wants to publish something. That’s how they get paid. At the intersection of magnum opus and getting paid lies the AreYouDoneYet? call / email. This is usually an (or several) unpleasant communication(s) for all involved. The publisher likely feels fiscal pressure to ship. The author feels deadline pressure. As I said, not pleasant. I know plenty of single-book authors who tell me, “I will never again publish a book through a publisher.” Without fail, each one lists an AreYouDoneYet? experience as their reason or part of their reason. I feel you. I really do. I don’t like those calls either. Many solve this problem by self-publishing. How do I solve AreYouDoneYet? 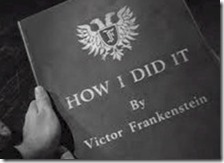 I change the order of the process and write the first draft, first – and then submitting the book proposal. If you don’t like the AreYouDoneYet? communications, get done first. If you believe self-publication is the route to go – and I write this as someone who has self-published – then you will need to write the book before you can publish it. Go ahead and write the first draft. It is not uncommon to experience difficulties writing such as writer’s block or finding adequate time to write. If you are writing about software that is scheduled to be released, the release schedule may slip. In fact, you should count on experiencing these difficulties and allow for them in your writing schedule, whether you are writing for a publisher or self-publishing. If you read the writing of others and think, “I could do a better job,” odds are you are correct (especially if you’ve read my writing). I am not a good writer. Prolific does not equal good. But – and this is an important but – you have to write to write better than me. “Why do you write, Andy?” In my humble opinion, why you want to write is the most important question you need to answer. This question needs to be thoroughly settled in your mind before you apply keystrokes to document editor. My answer? “I write because I love to write.” I think it stems from the joy I derive from learning and a desire to pass that joy to others. Trite? Perhaps. But altogether true. I enjoy writing. I write stuff no one else reads, even. I journal. I do not care if a single soul reads this blog post. Does that mean I don’t care about writing? Nope. I rewrite for you. So I rewrite. I do that here, even. I edit posts before publishing them. I often read a post later, cringe, and rewrite some sentence, paragraph, or entire section. Often, I add material or links for clarification. More often, I delete stuff (especially commas and parentheses and run-on sentences and sentences that begin with conjunctions and ellipses…). Robert Graves said, “There is no such thing as good writing, only good rewriting.” He’s right. In his book titled “On Writing,” Stephen King shares awesome tidbits about the craft. I found King’s On Writing and Steven Pressfield’s The War of Art and Do The Work inspiring and informative. Note: those links are to my Amazon Associates account. If you would rather not use an Amazon Associates link, please click one the following links: On Writing, The War of Art, Do The Work. These are books worth reading. I wish I’d read them before I started writing. I want you to experience the joy I derive from learning. I know some of you experience that joy because you tell me. The coolest thing about writing, for me, is helping someone learn something. If you are going to be a writer, please learn to write. Learning to write will actually solve most of the AreYouDoneYet? problem. Don’t believe me? Start writing a book today. Follow my advice and write first. You’re going to have to write the book for the book to get written, right? Even if you self-publish, you will need to write eventually. Why not start writing today? Do you remember grammar and language arts classes in grade school? I do. I made straight D’s in these classes until my senior year in high school. I had a fantastic teacher my senior year at Nottoway Senior High School. His name was Barrow Cyrus. Mr. C. taught with passion. I’m sure other teachers had passion; I noticed Mr. C’s passion. Years later I would see the movie Dead Poet’s Society and be reminded of him. I made a B in Mr. Cyrus’ class. I started enjoying reading. I began to think about writing. Remember those dumb outlining exercises? I hated those. First you have to plan how you’re going to write. You have to think first, then plan, and then write. Even back then, I enjoyed writing, but I wanted to get to the fun part and Just Write. Those dumb outlines will save you many a headache, many hours rewriting, and might just help you avoid one or more AreYouDoneYet? communications. Please trust me: I’m right about this. Does your outline have to be in standard outline format? Nope. It just needs to exist before you write the body of material. Start writing by creating a document for each chapter. Provide a title. Optionally, write an “In this chapter…” section. Don’t write more body text, not yet. Add section headers and optionally include an “In this section…” sentence or two. You may add subheadings. Please resist the urge to start writing in earnest on the topic until you’ve created an outline for each chapter you intend to write. Does this mean you will not add chapters later? Goodness no! You will add and remove and consolidate chapters as you write. Start here. Write an outline. An advance is a pre-payment for writing. It’s essentially a loan against future royalties. An advance is seen as a way to compensate authors during the writing process, since writing takes time away from other paying endeavors. I no longer accept advances on writing. Why? I find it depressing to receive the first royalty statement from the publisher stating something akin to, “You earned $100 in royalties. You now owe us only $400 of the $500 we advanced you.” I’d rather receive a check for $100. In worst cases, and advance can be weaponized against an author in an AreYouDoneYet? communication. I have a strict rule regarding ultimatums that applies to everything in life, not just writing. Andy’s Ultimatum Rule states: You can deliver an ultimatum to Andy once. I almost always capitulate when delivered an ultimatum. The other party gets their way. They have deployed a nuclear option, however; whether they realize it or not. My top priority from that point forward is departure. Now that’s not entirely accurate. Odds are, someone reading this post will, in fact, make money writing. I have. So why’d I write that? I wrote that because you should not begin writing if you are only in it for the cashola. If even part of the reason you want to write is to make money from writing, stop now and save yourself some frustration. I earn less – considerably less – than minimum wage writing. You can earn more money as a published consultant. If you want to look at this as a silver lining, please understand there’s a cloud attached. My first book project was Professional SQL Server 2005 Integration Services (Wrox, 2006). That particular book sold more copies than all my other books combined. I made money off that book. The year that book was released, my salary tripled. Why? That’s an excellent question to explore. Often, CIO’s and CEO’s do not follow the technology crafts. They don’t know who’s good from who’s not-so-good at tech. They listen to friends in the business for advice about who to hire. They hire larger firms that have been around longer because, they reason, those firms must be doing things correctly to have survived and grown. You and I know the biggest and oldest are not always the best. We understand technology and know how to discern between who’s up-and-coming and those riding past success – or even firms that have better salespeople – or firms that flat-out lie. Some CIO’s and CEO’s cannot separate the wheat from the chaff. Many can (they didn’t get where they are for no reason!) but not all. If you and I are bidding for the same work and I am published and you are not, I am probably going to win the work because the customer is going to reason, “Andy must know what he is doing because he’s written a book about the technology.” They would be correct insofar as I know enough to write about it. Does that mean I am going to do a better job for them, though? Maybe. But you may not get a chance to show them you can do better work than me because I can drop a physical book on their desk and you cannot. Yes. Yes, that’s wholly and completely unfair. So I lied. You will make money from writing, just not from the act of writing all by itself. If you accept an advance, please, please pay very close attention to the section in the contract about how the advance is distributed and collected. I’ve heard horror stories about authors actually owing the publisher money when books don’t sell as expected. Maybe reading this post has discouraged you. If so, I am glad. Do I like hurting people’s feelings? I promise you that I do not. If you are discouraged it’s likely because you opened this post thinking some things that are simply inaccurate about writing technical books. If I’ve disabused you of false notions, I feel I’ve done you a favor. Self-publishing is a way to avoid AreYouDoneYet? communications. Self-publishing is a way to avoid contracts and advances and all the associated headaches. Books have a shelf life. Publishers have relationships with book outlets – physical outlets like the ever-diminishing book box stores and with Amazon. In addition to these relationships, publishers also have marketing departments that create banner ads for books you and I see online. Publisher marketing departments also create email campaigns designed to attract buyers to books. Please do the math. Is your goal to make money from writing? I’ve shared my thoughts on that matter already. I contend the value of writing lies in consulting after being published. I feel that way because that’s what I have experienced. John Grisham probably has a different perspective. Once the writing is done – the work – and the book is published, it’s time to advertise. You want as many people as possible to learn about your book. You want them to want to buy your book. You want them to want to hire you as a consultant. And, as I said earlier, you want to win the horribly-unfair competition against those who are not published (or not yet published) for mind-share in the minds of CIO’s and CEO’s. The math is simple: More is better. It’s true that I can avoid the pitfalls I’ve listed (and many that I’ve not touched upon) by self-publishing. But, bottom line, you are most likely not going to be able to advertise as much or as well as a publisher. And if you are able to advertise as much or as well as a publisher, consider doubling – multiplying, really – the advertising of your book by combining your efforts with that of the publisher. One last thought about the math: Is it better to earn 100% of the royalties by selling 100 copies of your self-published book or to earn 10% of the royalties for selling 1,000 copies of your publisher-published book? If you read that and thought, “That’s the same!” you are wrong. Please scroll up and reread the paragraph about my salary tripling. Also, please see the section about the amount of work done by publisher advertising departments. You need mind-share. That’s why you should write (unless you love writing like I do!). Even if you love writing, you still need mind-share. Mind-share pays the bills. I wrote Building Custom Tasks for SQL Server Integration Services (clean link) from a 12-part blog series. I wrote the blog series in 2012. I copied the contents into Word, edited the material, built a more-relevant demo task, paid an artist $200 to design the cover (not this cover), and popped over to CreateSpace to ready the book for self-publication. 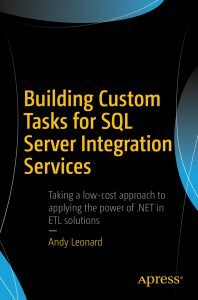 Building Custom Tasks for SQL Server Integration Services comes it at 111 pages. I really didn’t think Apress would be interested. Apress was interested. The book was released in July 2017. 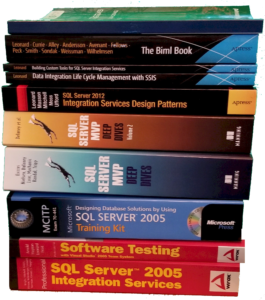 I negotiated a bunch or author copies for Building Custom Tasks for SQL Server Integration Services. A bunch. I failed to consider – and negotiate – more copies for my co-authors of The Biml Book. I led that team initially, and co-led the team along with Scott Currie at the end of the process. I regret my failure to lead and apologize to the team for missing this detail. Why did I negotiate a bunch of copies of Building Custom Tasks for SQL Server Integration Services? I wanted to be able to give copies of the book away at conferences and speaking engagements. I did and I have. The number of author copies is negotiable. The writing schedule is negotiable. The advance (or lack thereof) is negotiable. Ownership and the right to share some (or even all) of the content in other outlets such as blog posts and articles and whitepapers for which you may receive additional remuneration is negotiable. If you are considering writing, I encourage you to write. I want you to enter the profession (and it is a profession), though, with both eyes wide open. I want you to know what to expect. I do not want you to think writing is easy because it’s hard work (even if you enjoy writing). After publishing your first book, it’s normal – perhaps even a rite of passage – to look back and think, “I am never doing that again!” If you’ve published and feel that way, I promise you things get better with the second book and subsequent books. Why? Because your initial expectations were part of the problem. The problems caused by your inaccurate expectations about writing have been solved. 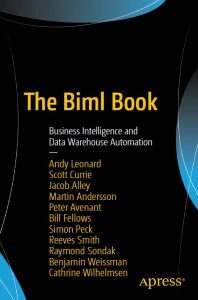 Last August, a small subset of The Biml Book author team rewrote the book. It took about three weeks. One Amazon reviewer commented on the unity of voice, even. That didn’t happen by accident. For me, the rewrite was the most difficult part of writing The Biml Book. When it was done I was ready to not think about Biml for a while. If you read that last sentence and know anything about me, you know that was a heavy emotion and a pretty big deal. I love Biml! But I needed a break. Enterprise Data & Analytics started a gig right after the rewrite concluded. We were required to be onsite for the kickoff and the customer’s HQ was a few hours drive east of my home in Farmville. Since the project was just getting started, Kent Bradshaw and I were onsite 8 hours per day; no more, no less. Being an early riser, I got up each morning a few hours before we were due at the work site and wrote. Of all the things to do, why did I write? After weeks of rewriting, why in the world did I write? I wrote because I love writing. 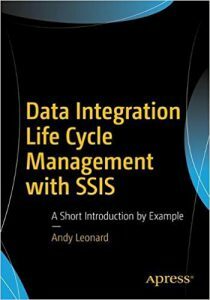 I wrote Data Integration Lifecycle Management with SSIS in one week, writing a couple hours each morning and a couple hours each evening. I spent several weeks rewriting the book, editing, removing, and adding content. But the 185 pages you can read today started as 110 pages in Word written that week. 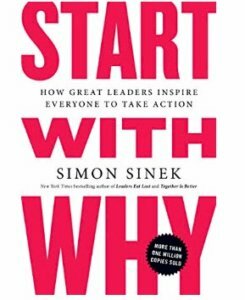 Start With Why and Find Your Why are excellent books. You need some reason to write. Really, you need motivation to accomplish anything in life. I don’t think money is a good-enough reason. You need something else – something beyond money. 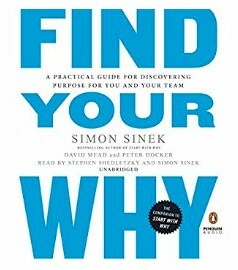 My why? Love. I love writing. Regardless of whether you write or not, find your motivation. Next PostNext Announcing SSIS Catalog Compare Version 3!